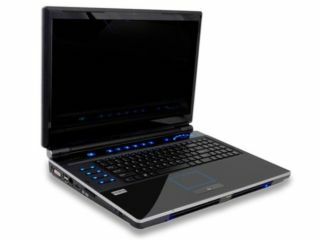 BFG – a company best know for its graphics cards – has announced a gaming laptop, with the Deimos X-10 offering an 18.4-inch screen and twin 1GB Nvidia GeForce GTX280M GPUs. Sitting firmly in the realm of desktop replacement, unless you're Geoff Capes, the Deimos X-10 has the option of an Intel Core 2 Duo, Quad or Extreme. For those who need a little extra storage there are three HDD bays, and the most expensive model brings you 8GB of RAM. Chuck in a Blu-ray drive, built-in subwoofer, card-reader, HDMI, four USB and, wait for it, a backpack (surely reinforced with steel?) and you can see why the basic level model weighs in at $1,859 – or a shade under £1,178. There's not any news on a UK release date yet, however, and we reckon you'd be testing the far reaches of your baggage allowance if you wanted to bring it back in your hand luggage from the States.